The authorities remained mute spectators as activists of the All Parties Hurriyat Conference kick-started their anti-election campaign by organising a rally on Friday at Abi Guzar in the heart of Srinagar. Senior Hurriyat leaders and activists carrying placards against the panchayat and local bodies elections marched through the streets of the city. The Hurriyat leadership has issued diktats against participating in the upcoming elections. The National Conference and the Awami National Conference, too, have already announced their decision of not contesting the elections. 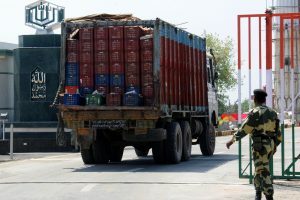 The People’s Democratic Party (PDP), too, decided on Friday not to contest the elections citing “apprehensions” over the future of Article 35-A. Former Chief Minister and PDP chief, Mehbooba Mufti, had earlier today nominated two former ministers, Haseeb Drabu and Altaf Bukhari, as members of party’s political affairs committee (PAC). The PAC had met on Thursday in Srinagar but did not take any decision whether to contest or not these elections. The party urged the Governor Satya Pal Malik to convene an all party meeting to reach consensus on holding the elections. The state Congress leadership has also said that the atmosphere was not congenial for holding the elections. 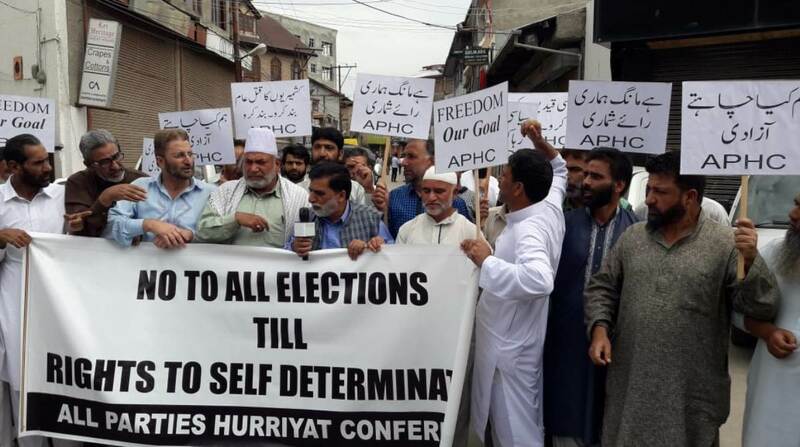 Meanwhile, accelerating their campaign against the elections, Hurriyat activists chanted slogans in favour of right to self-determination and probing of “human rights violations”. The rally was attended by Hurriyat activists including Bilal Sidiqui, Ghulam Mohammad Nagoo and Mohammad Yousuf Naqash. In a statement, Hurriyat chief, Syed Alishah Geelani, urged the Imran Khan government in Pakistan not to leave any stone unturned to pressurise New Delhi to settle the Kashmir issue.